Whether you’re jetting off for some fun in the sun in Australia or South America or simply hopping on a domestic flight to a neighboring state, air travel opens so many doors and offers so many different options. It’s never been easy to get around the world quickly, simply, and conveniently. There are thousands of airports linking regions, states, and countries together all over the globe, and each airport has both a name and an IATA airport code. These airport codes are made up of three letters and allow airline workers and travelers to easily distinguish one airport from another. If you’re traveling to Maui in Hawaii, you have the choice of three airports. Maui has Hana Airport, which has the airport code HNM and offers regional service to the eastern side of Maui; Kapalua Airport, which has the airport code JHM and offers flights to various destinations around Hawaii; and Kahului Airport, which has the airport code OGG and is the main airport for the island of Maui, offering flights both around the Hawaii islands and around North America. What is the Maui Airport Code? Despite being a relatively small island, Maui is home to three separate airports. Travelers on Maui therefore have three airport codes to consider: HNM, JHM, and OGG. Most travelers will be using OGG, as this is the only airport to support flights from locations outside of Hawaii. HNM and JHM are both regional airports. The address for airport code OGG (Kahului Airport) is 1 Keolani Pl, Kahului, HI 96732 and the airport can be contacted via 808 872 3830. The address for airport code JHM (Kapalua Airport) is 4050 Honoapiilani Hwy, Lahaina, HI 96761 and the airport can be contacted via 808 665 6108. The address for airport code HNM (Hana Airport) is 700 Alalele Pl, Hana, HI 96713 and the airport can be contacted via 808 248 4861. The history of Maui airports dates back to 1942, with construction beginning on a United States Military installation called Naval Air Station Kahului during World War II. When the war ended, this airbase was handed over to Hawaii to be transformed into an airport. In 1952, this airport, which had since become known as Kahului Airport and been given the airport code OGG, started operations. Hana Airport (airport code HNM) was opened in November of 1950, while Kapalua Airport (airport code JHM) opened up in 1987 and was named in honor of the local Kapalua Resort. JHM replaced another former Maui airport called Kaanapali Airport. Hana Airport operates for air taxis and runs flights to Kapalua Airport, while Kapalua Airport offers flights to places like Honolulu and Moloka'i. The major airport in Maui is Kahului Airport, which has the code OGG. 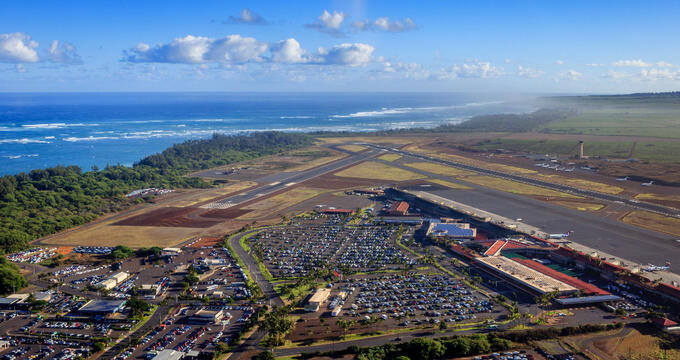 This airport actually features one of the busiest air routes in the entire United States, with the Honolulu to Kahului route ranking as 13th in terms of air traffic each year. This airport covers over 1,300 acres of land and operates flights to various destinations around Hawaii and North America. Some of the top destinations for airport OGG are Honolulu, Hawaii; Los Angeles, California; San Francisco, California; Seattle, Washington; Kailua-Kona, Hawaii; Lihue, Hawaii; Portland, Oregon; Dallas, Texas; San Jose, California; and Oakland, California. Parking is available at OGG airport. There's a cell waiting lot that allows drivers to freely park for an hour while waiting to pick up or drop off passengers, as well as short and long-term parking options. The rates are the same throughout the OGG parking lots, with a daily fee of $15. As many people visiting Hawaii don't have cars, there are various forms of public transportation available connecting airport OGG to other areas around Maui. For example, the Maui Bus runs two routes, numbered 35 and 40, which make multiple stops around Maui and can take people to the airport for a low fee. There's also an airport shuttle service running to various hotels and properties around the island. You can also choose to take a taxi to Kahului Airport, and fees will vary depending on the distance traveled. A ride from Kapalua, for example, can cost over $100, but a short ride from somewhere like Kahului Town or Wailuku will be much cheaper at $15-25. Getting around airport OGG is very simple. The airport is essentially formed in a long, thin line with a central building in the middle and the various gates on either side. When you enter the airport, the check-in desks should be situated on your right hand side. From there, the security checkpoint is easily marked and you'll head onto the second floor of the airport building, turning left for Gates 17-39 or right for Gates 1-15. There are no on-site hotels at OGG Kahului Airport, but there are several hotels very conveniently located just a few minutes away from the airport. Many of these hotels will provide complimentary shuttle services to the airport on a daily basis. If there is no shuttle at your hotel, you can simply reserve a taxi and reach the airport in a matter of minutes. Here are some details on the top hotels in the OGG airport area.